Spatio-temporal data streams are huge amounts of data pertaining to time and position of moving objects. Mining such amount of data is a challenging problem, since the possibility to extract useful information from this peculiar kind of data is crucial in many RFIP application scenarios. Moreover, spatio-temporal data streams pose interesting challenges for their proper representation, thus making the mining process harder than for classical data. 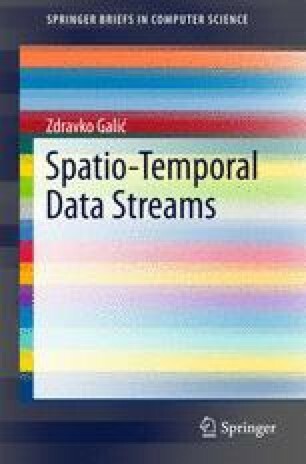 In this chapter we deal with a specific spatio-temporal data stream class, namely trajectory streams that collect data pertaining to spatial and temporal position of mobile objects.